I know I'm getting a little ahead of myself with posting winter cookies. 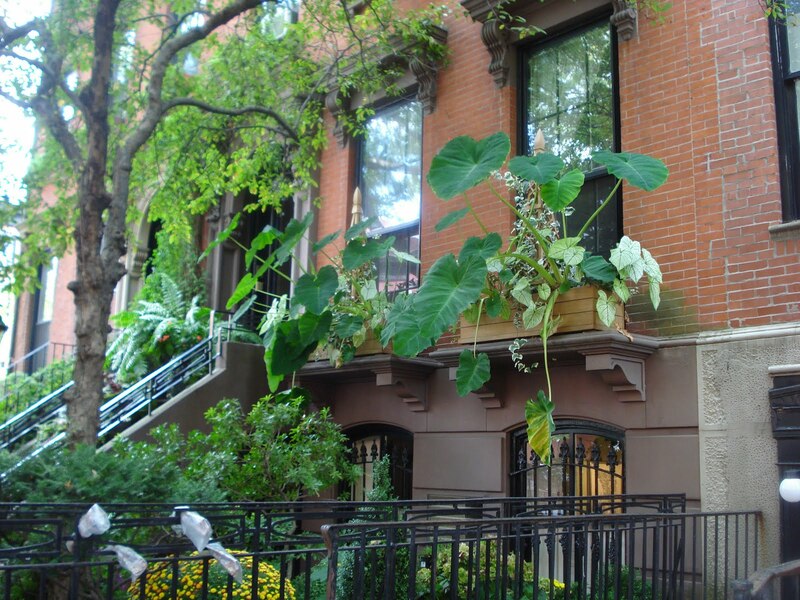 We are just into Fall, after all! 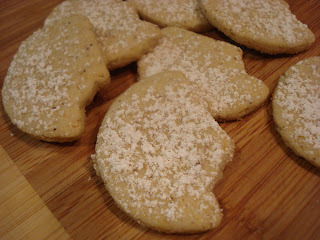 But this cookie is basically a hazelnut shortbread cookie with a "snowy" dusting of confectioners' sugar. 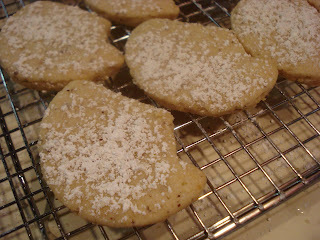 The recipe is from "Nantucket Open-House Cookbook" and since I love shortbread, I thought I'd give this one a try. The cookies are crunchy and buttery and they have just the right amount of sweetness, even with the dusting of confectioners' sugar. I made two changes, additions really. I added 1/4 teaspoon of salt and rather than using 2 teaspoons of vanilla, I used 1 teaspoon plus 1 teaspoon of hazelnut extract. 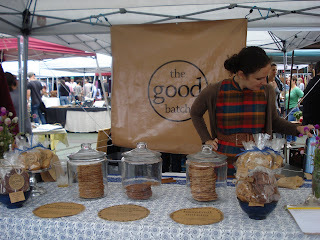 If you don't want to go out and buy hazelnut extract, because let's face it, extracts are pricey, just use all vanilla. What you want to do first is toast the hazelnuts. Place them in a single layer onto a rimmed baking sheet and put them in a 350 oven for about 8 minutes. 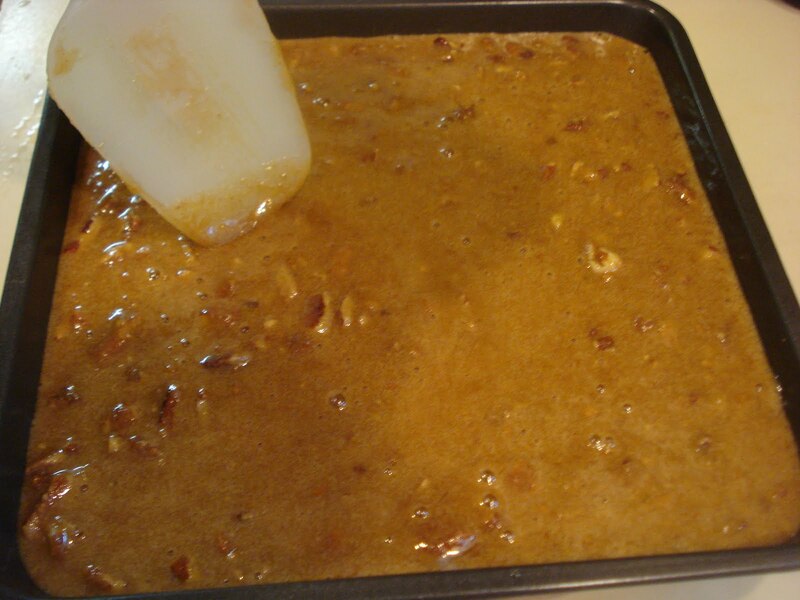 Get out a large dish towel and once the nuts come out of the oven, dump them ( carefully) into the dish towel and cover them with the towel for about 30 seconds. Then rub them vigorously, still with the towel covering them, to get the skins off. Now, not all the skins will come off, and that's okay. 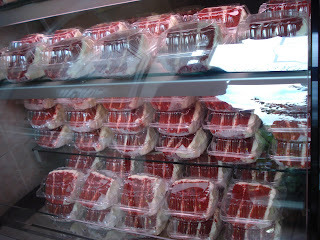 They still taste fine, they just look better skinned..err..skinless. (Well, you get what I mean!). Beat the butter in a large mixing bowl til fluffy. Gradually beat in the hazelnuts, vanilla ( and hazelnut extract, if using) and lemon zest. 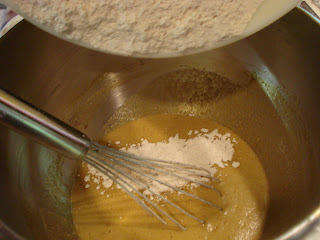 Using a wooden spoon, gradually stir in the flour and salt til it's all blended. And roll out between 2 sheet of wrap to 1/4" thickness. Then bake them til lightly browned. When they've cooled, sift confectioners' sugar over them. 1. 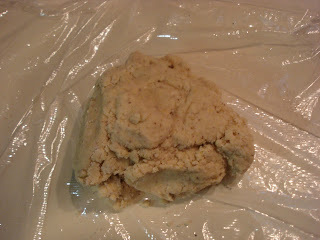 Beat butter in a large mixing bowl til fluffy. 2. Gradually beat in hazelnuts, vanilla ( and hazelnut extract, if using) and lemon zest. 3. Beat in the granulated sugar. 4. Using a wooden spoon, gradually stir in the flour and salt til it is all well blended. 5. 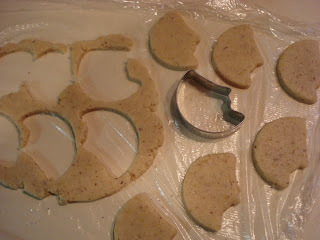 Roll out the dough, 1/4" thick between 2 pieces of plastic wrap and cut out shapes. 6. Bake the cookies on ungreased baking sheets til lightly browned, about 12 to 15 minutes. 7. Dust cooled cookies with confectioners' sugar. We have a table set up at our Saturday Farmer's Market filled with books that people donate. The books are free to anyone and, of course, I always check out the available cookbooks. This recipe came from a charming book that I was fortunate to find, "Nantucket Open-House Cookbook" by Sarah Leah Chase. I was looking for a quick dessert recipe and this one sounded quick and easy..and it was! 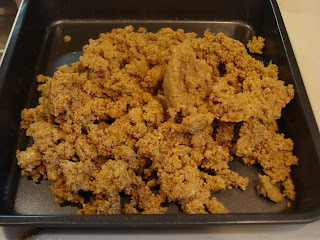 The crust is basically made from graham cracker crumbs and butter which you bake first, then pour the filling over top and bake for a little longer. 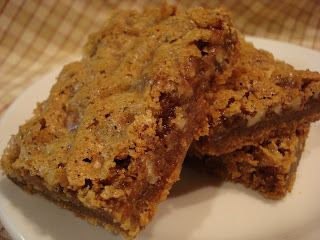 I found the crust to be a bit too buttery but still a delicious bar cookie. 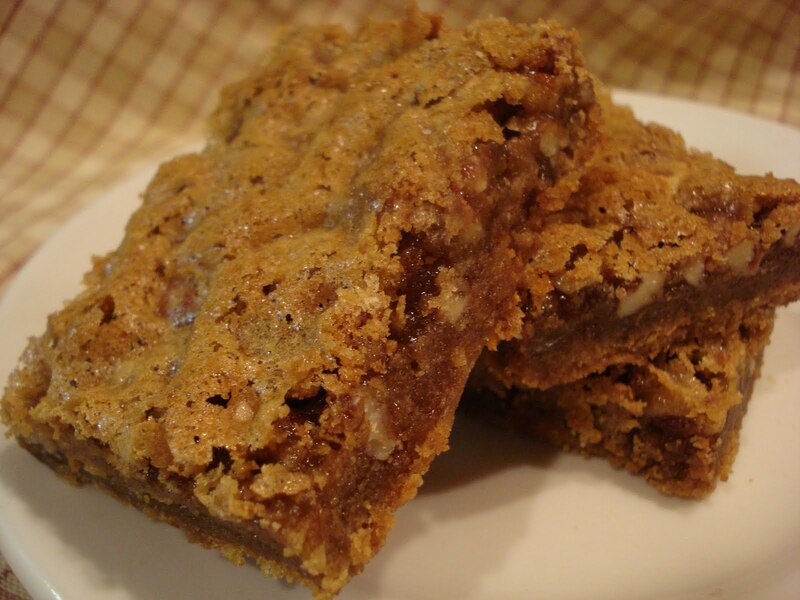 The pecans give a great crunch and the bars are chewy. 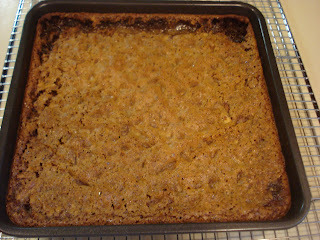 After I baked the bars I saw another version of this recipe online and it was for double this recipe size, (13" by 9" pan). 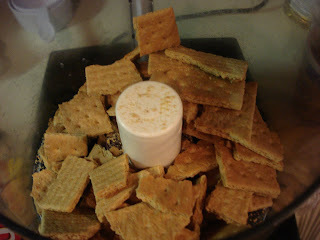 I noticed that the butter amount for this doubled size was 1 1/2 sticks to 3 cups of graham cracker crumbs. This recipe in the book calls for 1 1/3 cups of crumbs to 1 stick of butter so I think that's why the book version has too much butter. ( Hope this makes sense to you). So making the changes in the butter amount should give a perfect chewy bar cookie. Let me know if you try it and how it works for you. Start by making the crust by placing the crackers in a food processor. Give them a good spin to get nice fine crumbs. Then place the crumbs, sugar, butter and flour in a mixing bowl and mix til moist and crumbly. And press the mixture evenly over the bottom. While it's baking, make the topping by placing all the ingredients in a medium bowl and stir til blended. Once the crust is baked, pour the topping over the crust and bake for another 20 minutes. It should still be a little jiggly, not too set because it firms up as it cools. I found it was easier to cut into pieces after chilling in the fridge for about an hour. 1. Place the crackers in a food processor and pulse to make fine crumbs. 2. 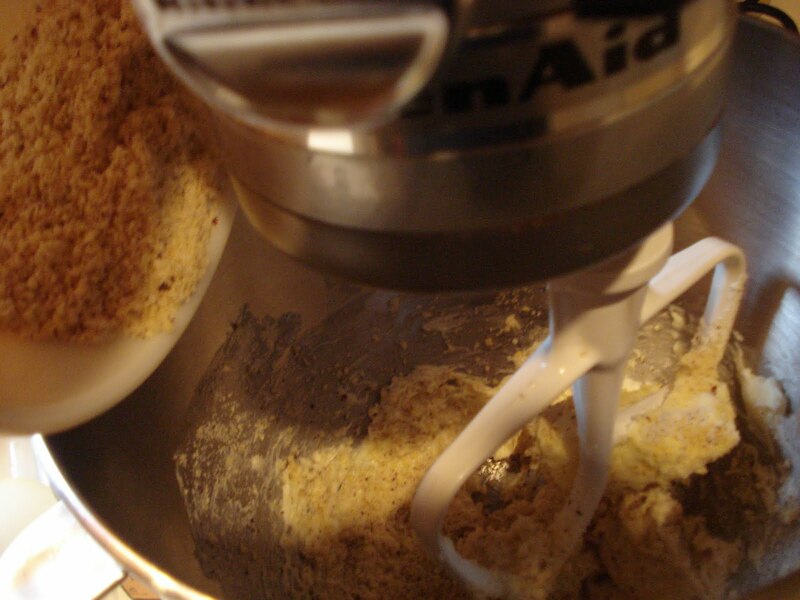 Mix the crumbs, sugar, butter and flour in a mixing bowl til moist and crumbly. 3. 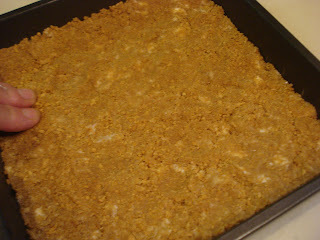 Press the mixture evenly and firmly into the bottom of a 9" square pan. 4. Bake til lightly browned, about 20 minutes. 1. Stir all the ingredients together til blended. 2. Spread the topping over the baked crust and bake for 20 minutes or til just slightly jiggly still. 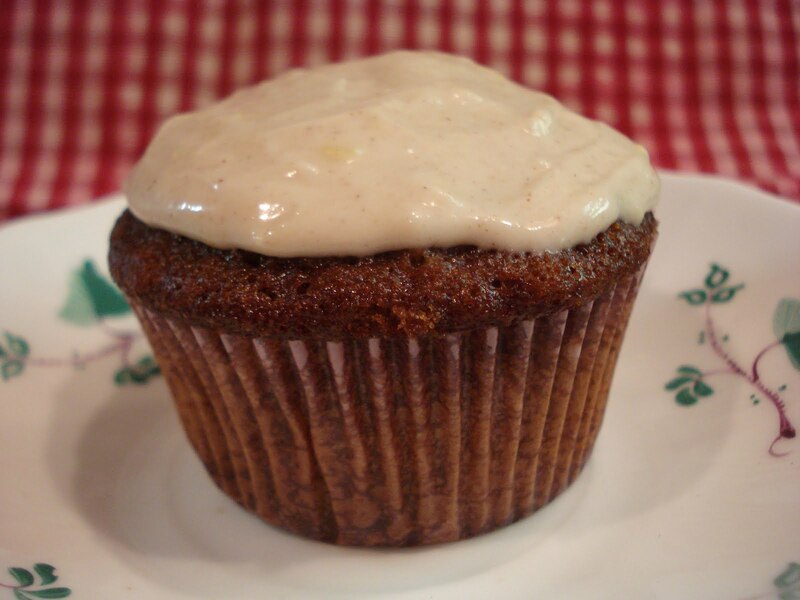 If you love gingerbread..these cupcakes are for you! The molasses and brown sugar give these little cakes a rich deep flavor and the spiced frosting take them over the top..really! 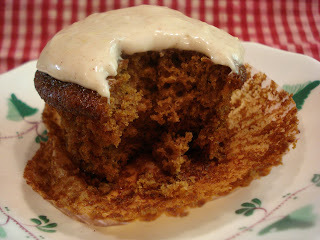 The frosting for these cupcakes is an easy cream cheese and confectioners' sugar mix using either green cardomom ( which is the one that's widely available) or you can switch to another spice such as allspice or, what I used, cinnamon. 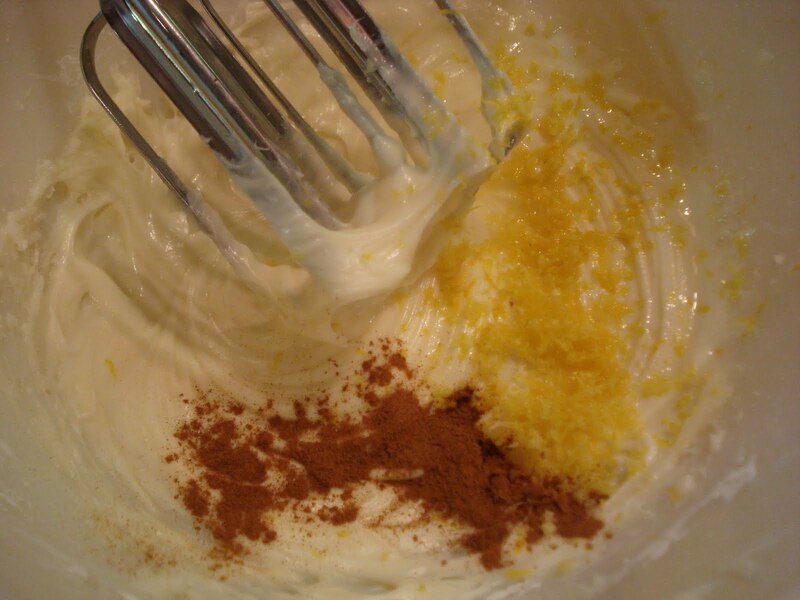 You can also use orange zest rather than the lemon zest , it's up to you. Which ever spice you choose, it's delicious. Sift or whisk together the flour, spices, zest and salt into a small bowl. 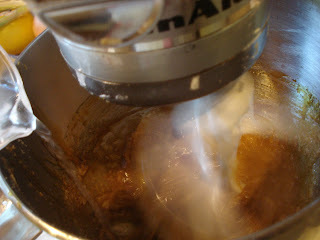 Cream the butter and brown sugar in a mixer bowl til light and fluffy. Beat in the molasses, egg and vanilla. In a small bowl ( or a small measuring glass), stir together the boiling water and baking soda. 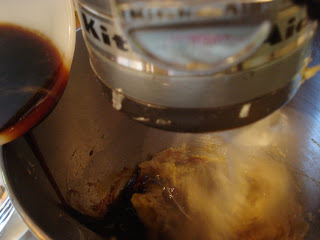 Blend this mixture into the creamed butter/molasses mixture on low speed. 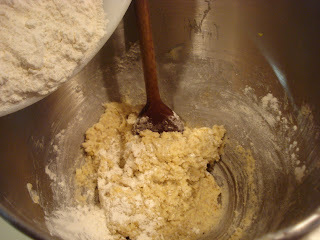 Then whisk in the flour mixture til combined. Spoon the batter into your prepared muffin cups, filling about 2/3 full. Bake about 20 minutes or til a toothpick inserted comes out clean. 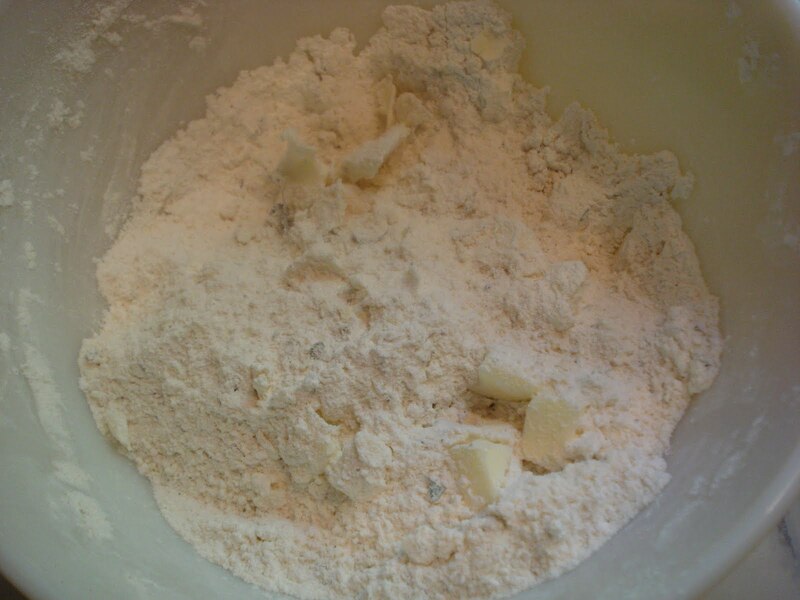 Cream together the cream cheese and confectioners' sugar in a medium bowl til it's light and fluffy. Beat in the vanilla. Add the lemon juice, lemon zest ( or orange) and cardamom (or other spice you're using)and beat til fluffy and smooth. Chill the frosting til ready to use. 8 tbsp. ( 1 stick) unsalted butter, room temp. 8 ozs. cream cheese, room temp. Preheat oven to 350. Grease or line with paper liners a standard size muffin pan. 1. 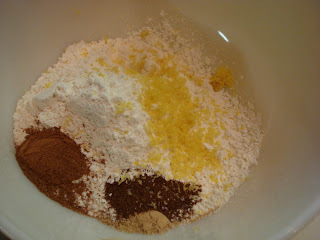 Sift or whisk the flour, cinnamon, ginger, cloves, lemon zest ( or orange), and salt into a small bowl. Set aside. 2. Cream the butter and brown sugar in a mixer bowl til light and fluffy. 3. Beat in the molasses, egg and vanilla. 4. In a small bowl, or glass measuring cup, stir together the boiling water and baking soda. 5. Sti the mixture into the creamed butter/molasses mixture. 6. 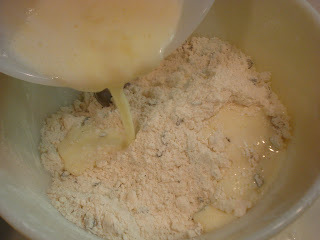 Whisk the flour mixture into the creamed mixture til combined. 7. 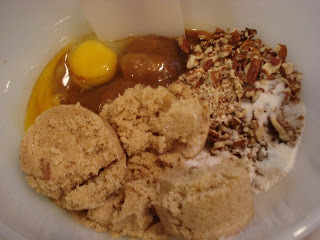 Spoon the batter into the prepared muffin cups, filling 2/3 full. 8. Bake about 20 minutes, or til a toothpick inserted into the center comes out clean. 9. 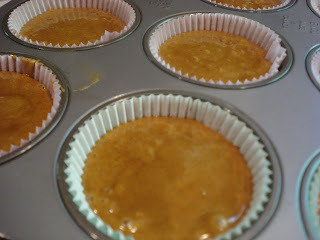 Allow the cupcakes to cool in the pan 5 minutes, then transfer to a wire rack to cool completely before frosting. 1. Cream together cream cheese and sugar in a medium mixing bowl til light and fluffy. 3. Add the lemon juice ( or orange), lemon zest ( or orange) and cardamom ( or cinnamon or allspice) and beat til fluffy and smooth. 4. Chill the frosting til ready to use. I'm always up for trying new scone recipes, especially savory ones. 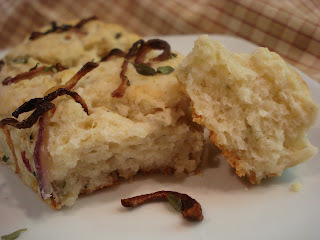 Reading through the recipe, I thought the addition of parmesan cheese with all the herbs would be really delicious..and I was right! These are from the cookbook I recently bought, " The Spice Kitchen". And you see those fried and baked onions on top? They are the best, crunchy with great oniony flavor. I used mostly fresh herbs since I have so many growing in my garden. ( I did use a little dried also to up the flavor). The book says you can use fresh or dried herbs for any of the recipes in the book. It's a three-to-one ratio of fresh to dried. One tablespoon of fresh herbs for each teaspoon of dried. One important change I made was that I cut the scones into wedges before baking. 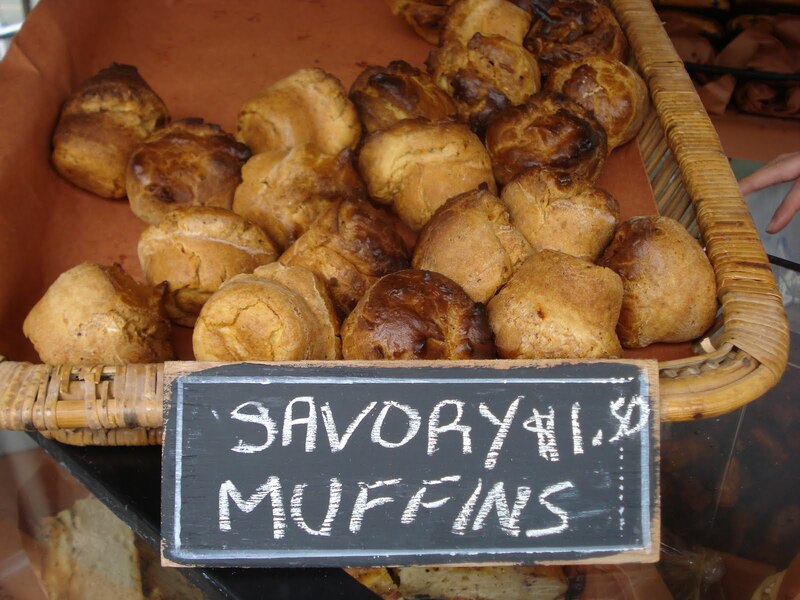 The original recipe calls for scoring, then baking the rounds, then after baking, cut them apart. I've never made scones this way..and I wasn't about to start now!). 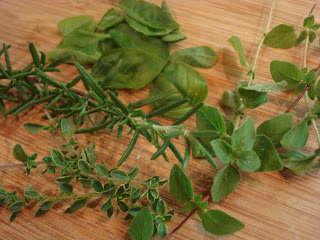 You'll be using 4 herbs, basil, thyme, rosemary and oregano and like I said above, fresh or dried. Here they're ready to chop up. 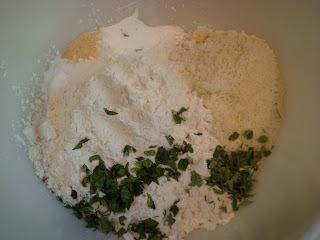 Combine the dry ingredients, including oregano and basil in a medium bowl. Slice your onion in very thin slices and saute in some butter til soft. Then add in the thyme and rosemary. Set it aside for the topping. 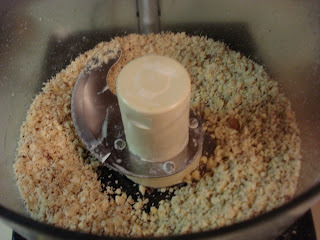 Add the butter to the dry ingredients and using a pastry blender or 2 knives ( I use my fingers), work the butter into the dry til it's the size of small crumbs. 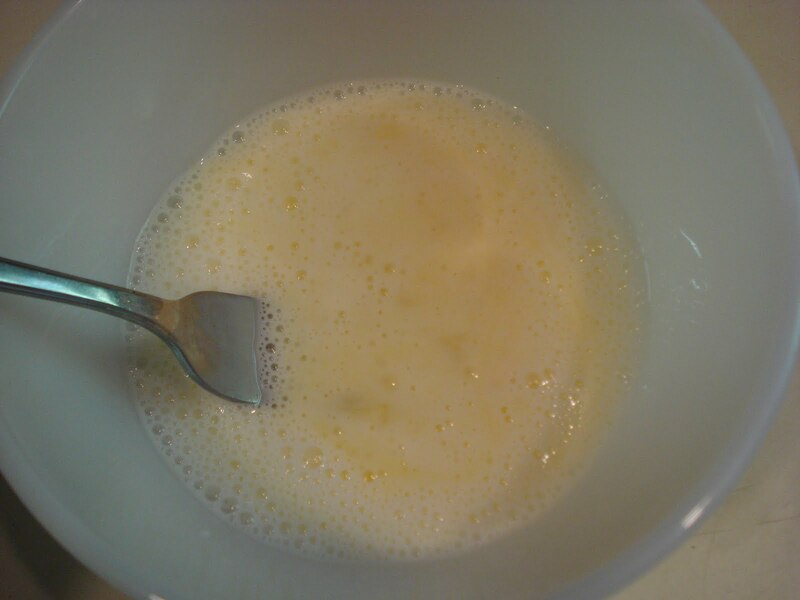 Whisk the egg and buttermilk in a small bowl. And add the wet to the dry, stirring with a fork til just combined. Don't overwork the dough. ( I needed a little more buttermilk but you may not). It should be moist but not too wet. 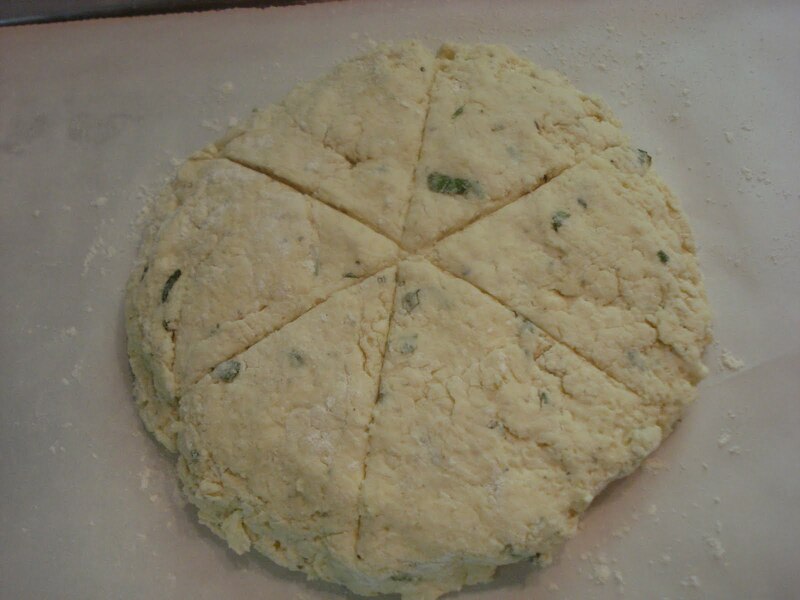 Divide the dough in half and form two round balls. 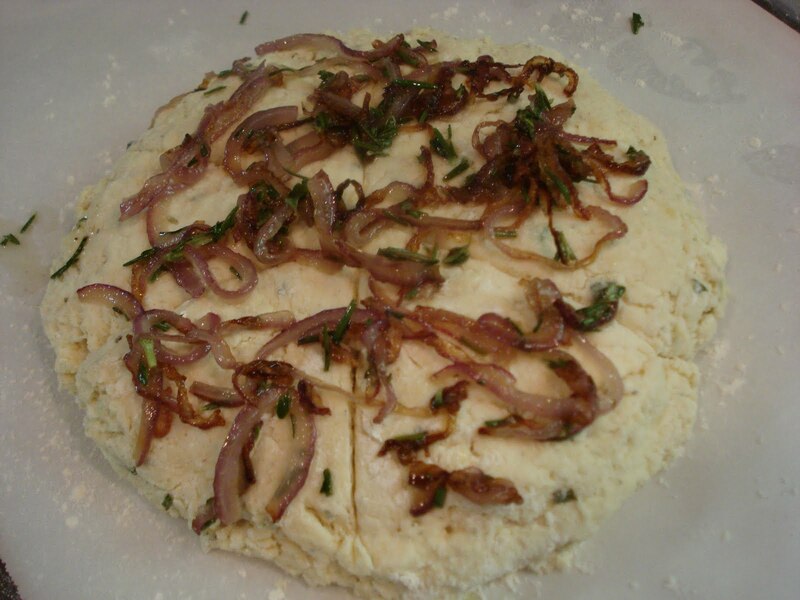 Place both onto a parchment lined baking sheet and flatten to 8" circles. 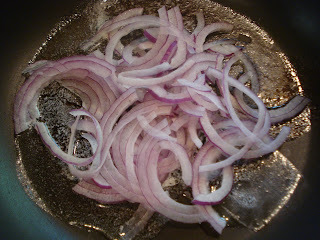 And divide into 6 wedges ( I put the onions on top before I cut them into wedges..don't do it this way!). Cut them apart first. Put the onions with rosemary and thyme on top. See, I didn't cut them apart before I put the topping on and, it was still okay, just a little tricky to cut. Then bake for 20 to 25 minutes. Parmesan Herb Scones (from "The Spice Kitchen"
Remember: The amounts for the herbs below are for dried. If you're subbing fresh for dried use 3 times more). Melt 2 tbsp. butter in a medium skillet over medium high heat. 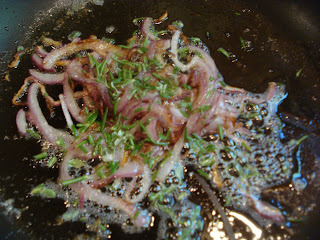 Add the onion and saute til tender. Stir in rosemary and thyme. Spread the mixture evenly over both rounds. 1. 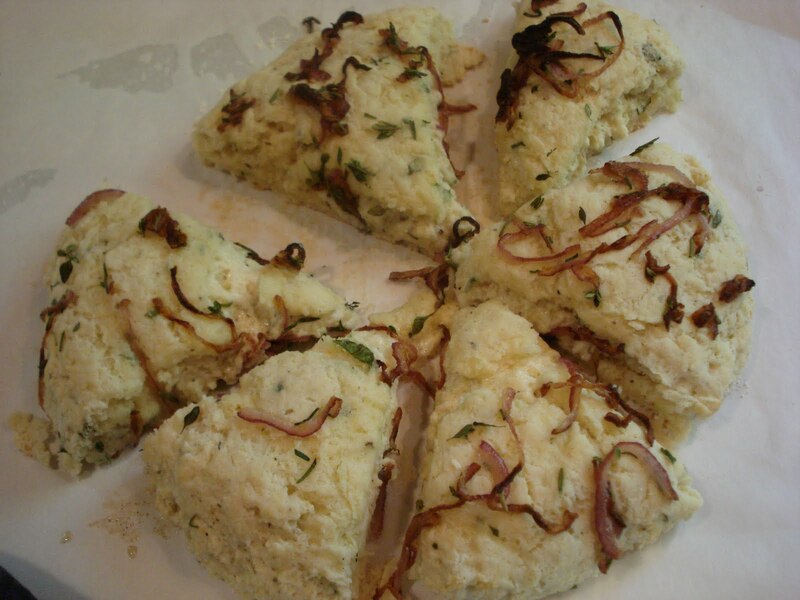 In a large bowl, combine flour, cheese, baking powder, oregano, basil, salt, garlic powder and baking soda. 2. 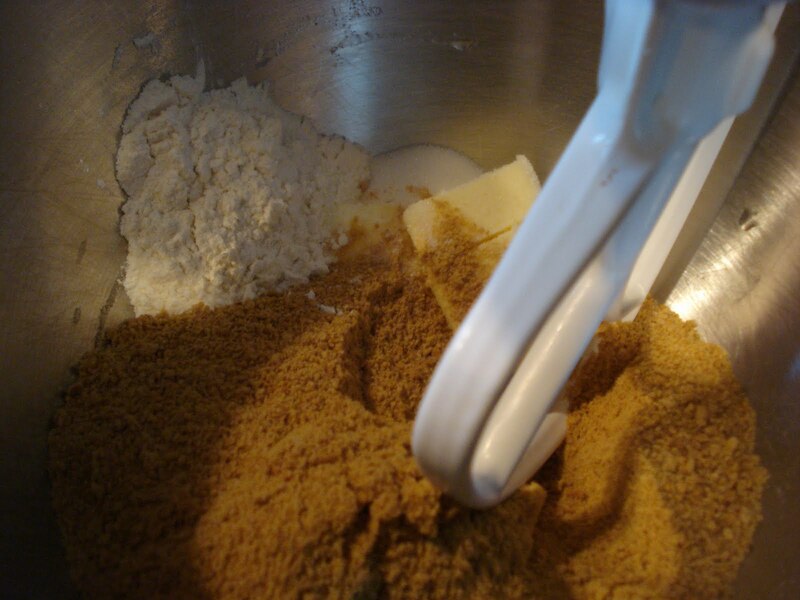 Using a pastry blender or 2 knives ( I always use my fingers) cut in the 6 tablespoons of butter til it is the size of small crumbs. 3. 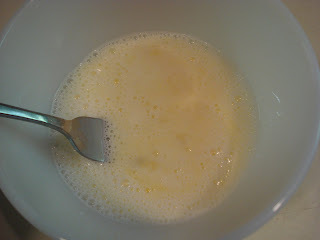 Whisk together the egg and buttermilk in a small bowl and add to dry mixture, stirring just til combined. 4. Turn the dough out onto a lightly floured surface. Handling the dough as little as possible, knead the dough 5 to 6 times. ( I don't do this step. I simply place the dough onto the parchment paper and form into a round and flatten. The less you work the dough, the better). 5. Place both balls onto the parchment lined baking sheet and flatten to 8" circles. Flour your fingers to keep the dough from sticking. 6. 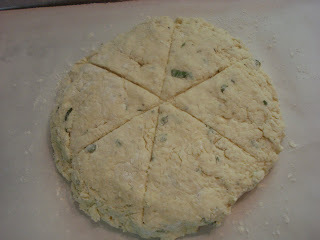 Score the dough and divide each circle into 6 wedges. ( I also cut them apart.). 7. 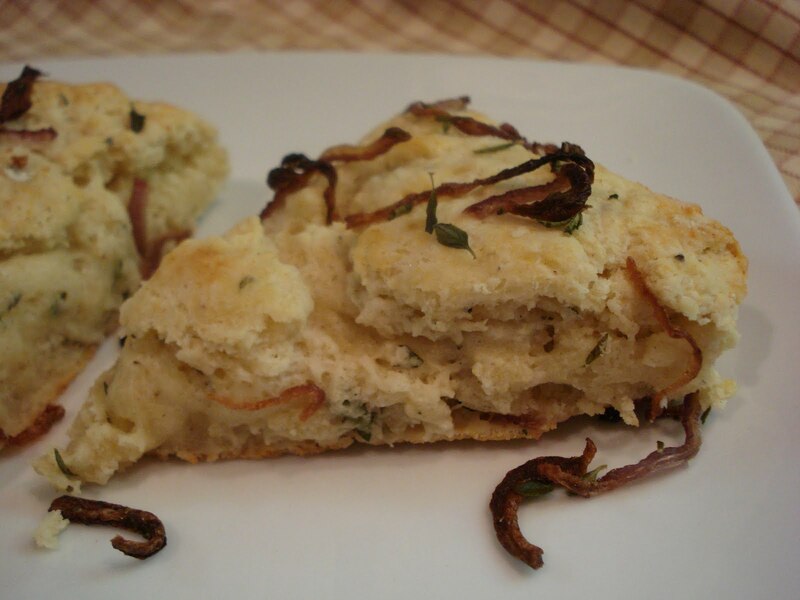 Sprinkle the onion topping onto the scones and bake 20 to 25 minutes, til the top is golden brown. 8. Cut into wedges ( if you didn't already) and serve. Yesterday was a most perfect day. I was finally able to get someone to work my usual farmer's market space so we could take a long awaited trip into New York..Fort Greene, Brooklyn to be exact to visit and see for myself some of the wonderful foodie companies I have been reading about over the past few years. 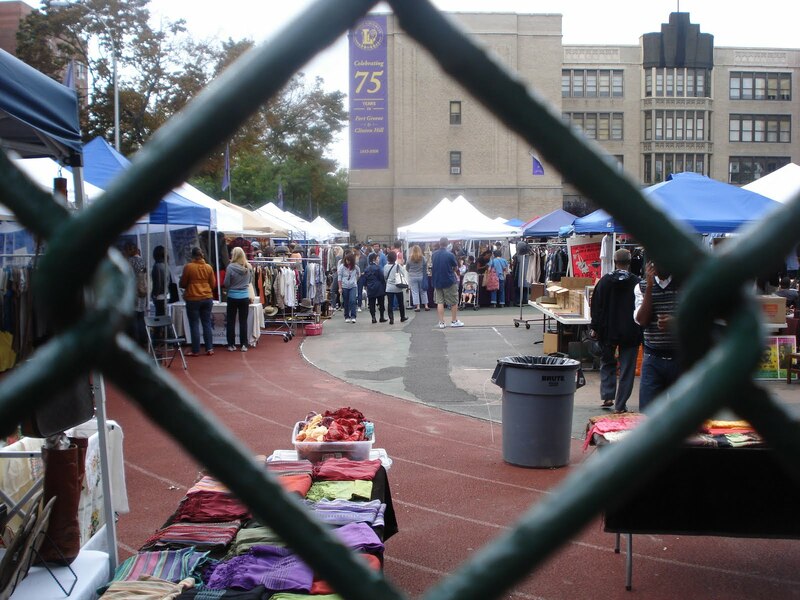 And visit the famous Brooklyn Flea. From all the photos I took it seemed like, Country girl let loose in the Big City! I actually worked in Manhattan for a few years just out of college, so it's not that I've never been there! This was the first time I ventured there. And it was a wonderful experience. 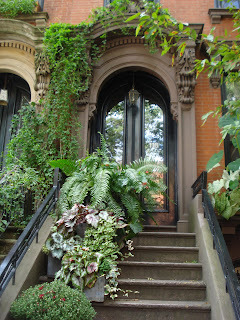 The Fort Greene section of Brooklyn is filled with the most beautiful brownstones I've ever seen. They were mostly all built between the 1850's and 1860's. 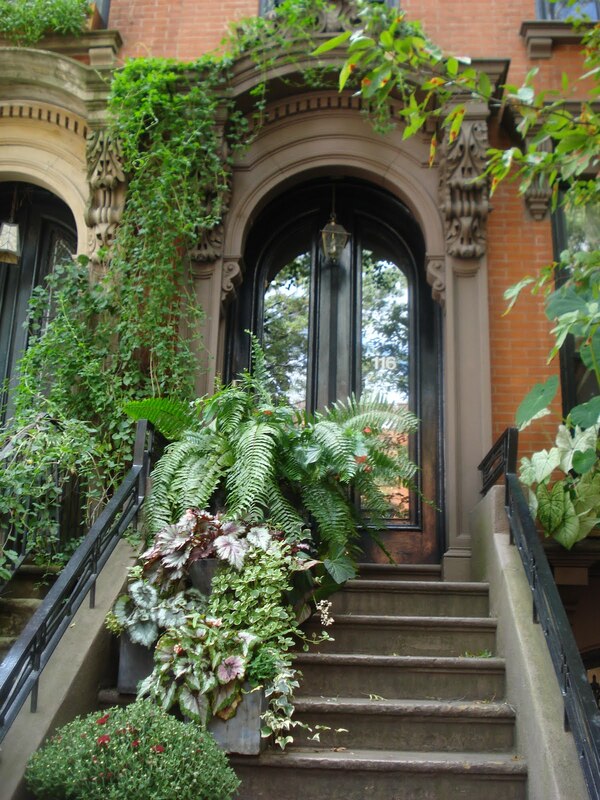 Just walking to the Flea from where we parked took me forever because I had to stop and take a picture on every block..it's just that pretty! 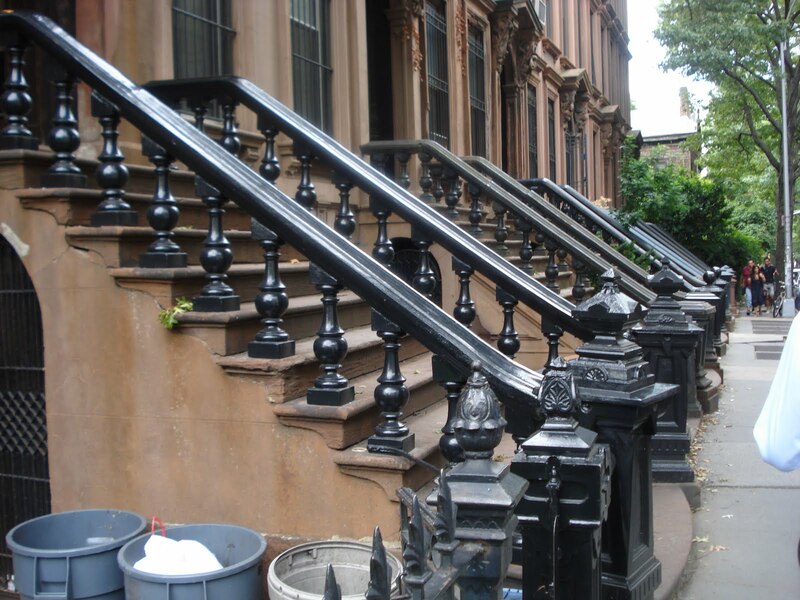 Every street around the Flea is charming, with beautiful brownstones trimmed with ornate detailing, tons of black wrought iron railings and the plantings just make it a wonderland! So we finally made it to our destination and the first stop for me had to be one of the cookie companies I follow, probably because they started their company the same time I did. 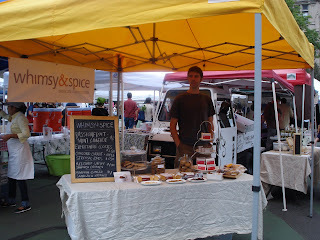 We met Mark from his company, Whimsy & Spice. It's funny how you feel like you kind of know these people from reading their blogs! Anyway, we had time to chat a little bit and I bought some of his cookies and marshmallows..for research purposes, of course! Brooklyn Soda Works is another company I'd read about so we had to taste one of their soda flavors, Apple & Ginger. It's a carbonated fresh juice and it was delicious! 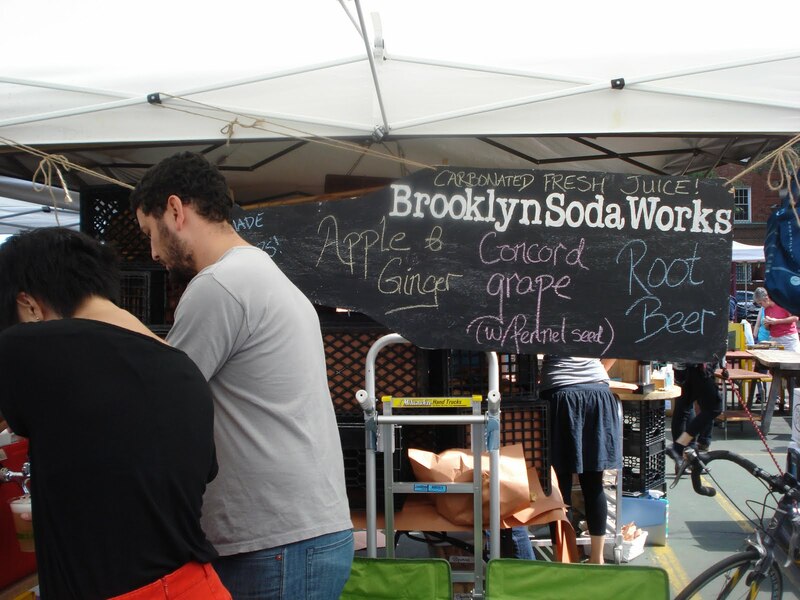 Their sodas have great flavor and you can tell from talking to them how passionate they are about it. 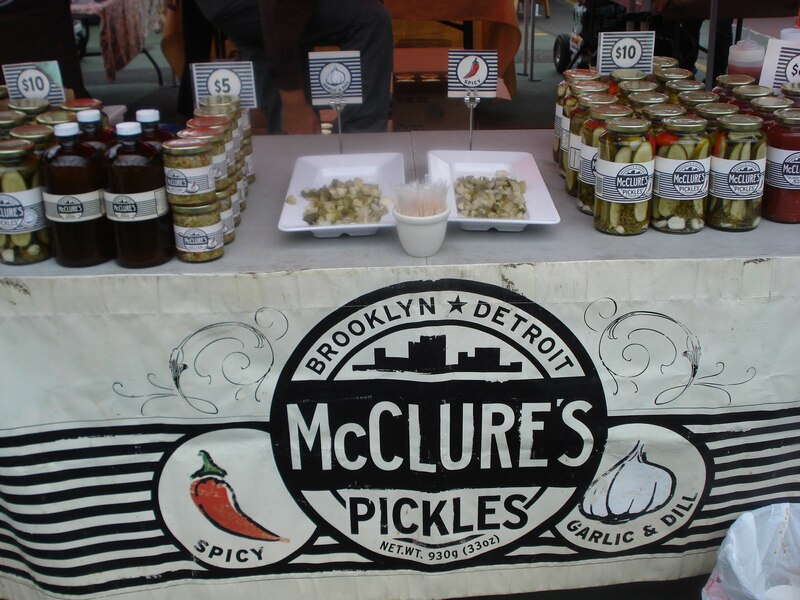 This is one of the newer companies at the Flea. Anna was so sweet and friendly and it was such fun to talk to her. Who says New Yorkers aren't a friendly bunch! She makes something called Stroopwafels, a different kind of waffle than what we're used to. It's very thin and crisp and she sandwiches them with a filling in between. Yum! 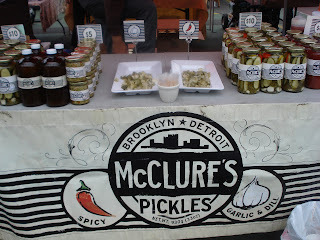 And pickles and so much more. 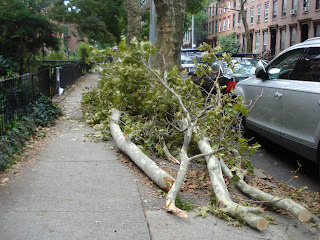 After we finished checking out all the vendors, we walked some more and saw some remaining downed trees and tons of branches from the confirmed tornados Brooklyn had Thursday afternoon. You can see from all these lovely Sycamore trees that it's no wonder so many blew down in the tornado. 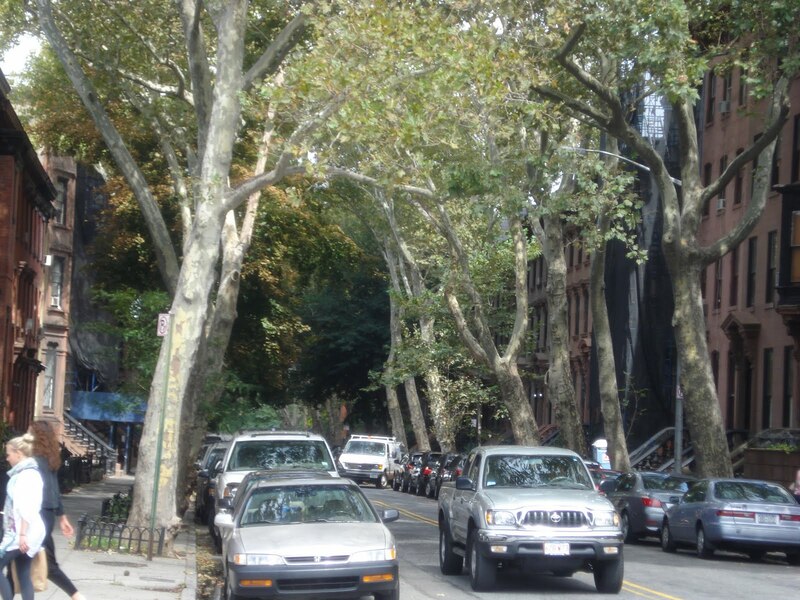 I love the arch they form on this tree lined street. 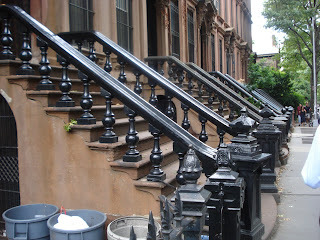 And those heavy massive black wrought iron railings are everywhere. Just like the ones you see in the movies! 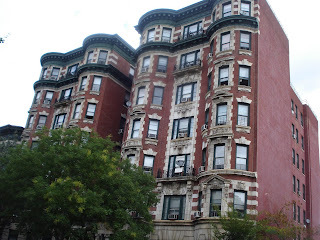 The wonderful architecture of the old apartment buildings is amazing. 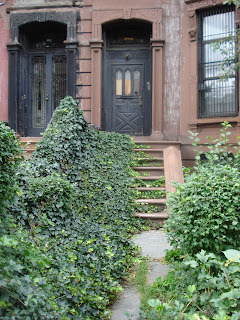 And some of the brownstones looked abandoned, or the owner just never uses the front door! 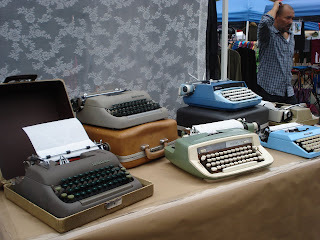 How about this blue one? 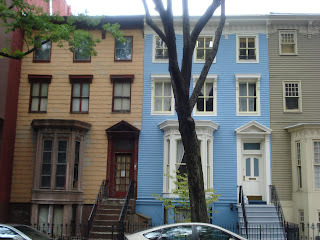 These three looked a little like a patchwork of buildings. Then we walked over to a corner grocery store because one of the vendors I wanted to see, Early Bird Granola, wasn't at the Flea but I was able to buy a bag at a very upscale grocery store. 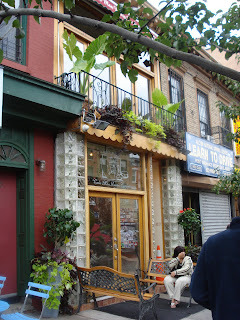 Then across the street I spotted Cake Man Raven's Bakery and just had to go inside. 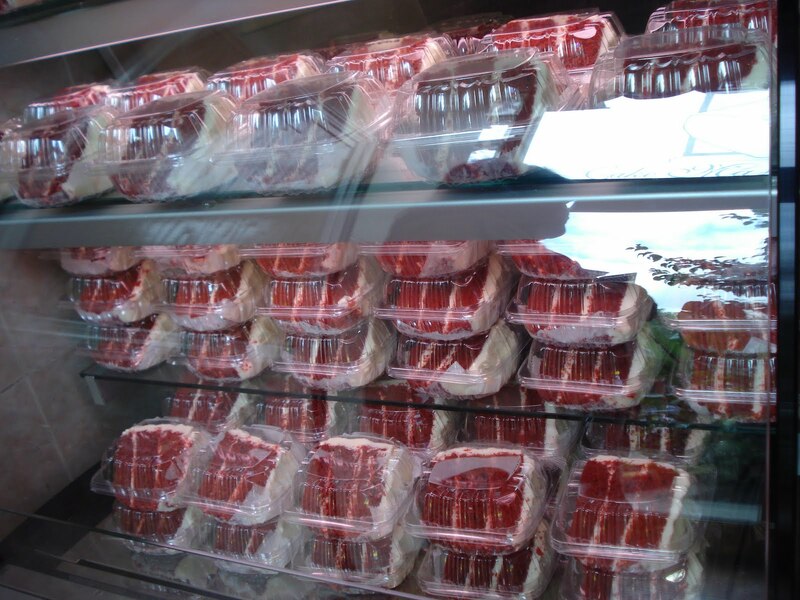 But it was so odd..the cases were only filled with slices of Red Velvet Cake, nothing more! Walking back to our car we passed Tim Allen from Food Network's "Chopped" show. I couldn't help but say hi to him as we passed and he was nice enough to say hi back! To drive to the next destination...Four and Twenty Blackbirds. This pie shop is in another section of Brooklyn called Gowanus. 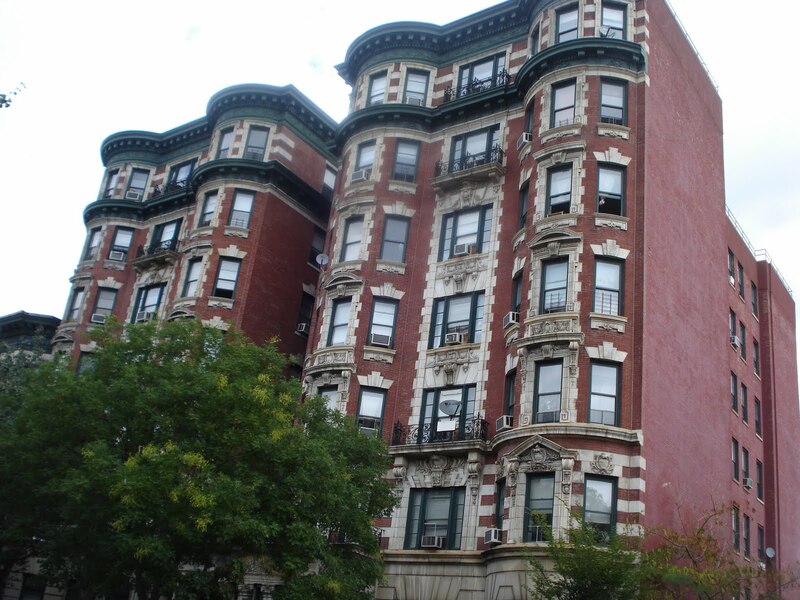 It's not nearly as pretty as Fort Greene, with lots of warehouses and industry. 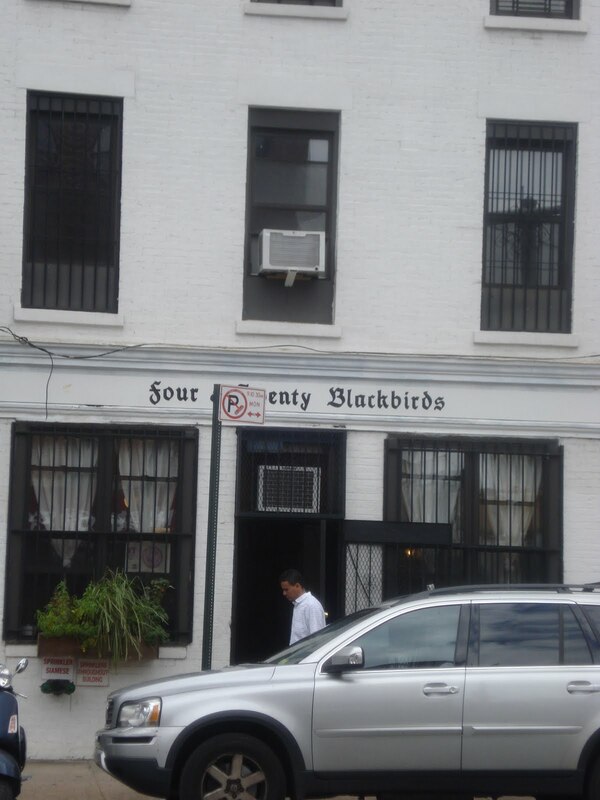 Seemed like an odd location for a pie shop but we went in and ordered one piece of pie to taste. We tried the Salted Caramel Apple. ( it was..shhh..okay but not great). I did like the old english style of lettering on the outside of their building though. 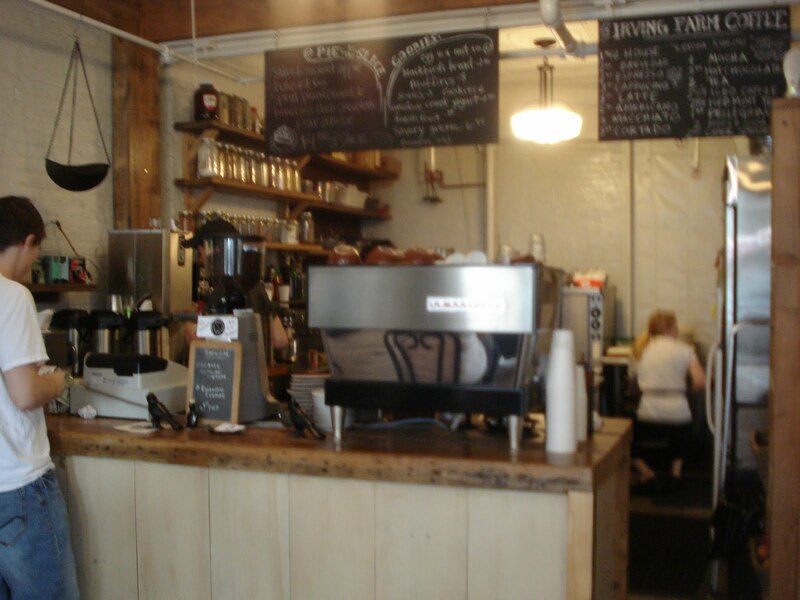 And the inside had neat old tin ceiling panels lining the walls. So that's pretty much our day. Hope I haven't bored you with all the pics! And if you ever get a chance to visit, remember to bring your camera. It's gonna get a workout!